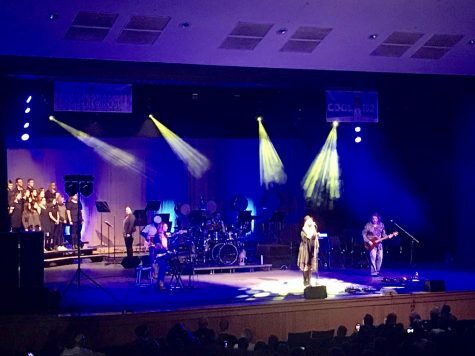 Tusk, A Fleetwood Mac Tribute Band gave the ultimate concert experience on January 12th at the Barnstable High School Performing Arts Center in support of keeping music education alive. The original five member British blues rock band, Fleetwood Mac originated in England and were mainly popular in the 1970s-1990s with many fans still enjoying their music today. The original band members are Stevie Nicks on lead vocals, Lindsey Buckingham on vocals & guitar, Christine McVie on vocals/keyboard, John McVie on bass guitar, and Mick Fleetwood on drums/percussion. Tusk, named after one of Fleetwood Mac’s hit songs, cover all of their greatest hits with identical aspects. Tusk has been making music together all over the world in various combinations and styles for over 25 years. The talented band members are Kathy Phillips, as Stevie Nicks, Scott McDonald as Lindsey Buckingham, Jerzy Jung as Christine McVie, Tom Nelson as Mick Fleetwood and Randy Artiglere as John McVie. The band performed a two hour concert including well over 18 songs written by Fleetwood Mac. Some of the more popular songs were The Chain, Dreams, Tell Me Lies, Over My Head, Big Love, Say You Love Me, You Make Loving Fun, Gypsy and Sara. Many of these hits came from the album, Rumours. Silver Springs was a beautiful song that was cut from the Rumours album, yet it was a fan favorite of the night and well performed by Kathy Phillips on lead vocals. Her distinct, raspy voice portrayed Stevie Nicks closely. Kathy, dressed in a gypsy-style skirt wearing a fringe poncho, swayed and danced to the music rhythmically with her tambourine as Stevie Nicks. Jerzy Jung, dressed in bell bottoms and and a bell sleeved shirt from the 70s era played the keyboard and displayed an energetic stage presence throughout the evening. She and Scott McDonald are both music teachers themselves which explains why keeping music education alive in schools is important to them. During the event, bassist, Randy Artiglere played a spectacular solo and wowed the audience with his skills and cool rhythm. One of the highlights of the the evening was when drummer, Tom Nelson rocked the house with dozens of audience members up on their feet while he performed sample hit songs popular in the 80s. 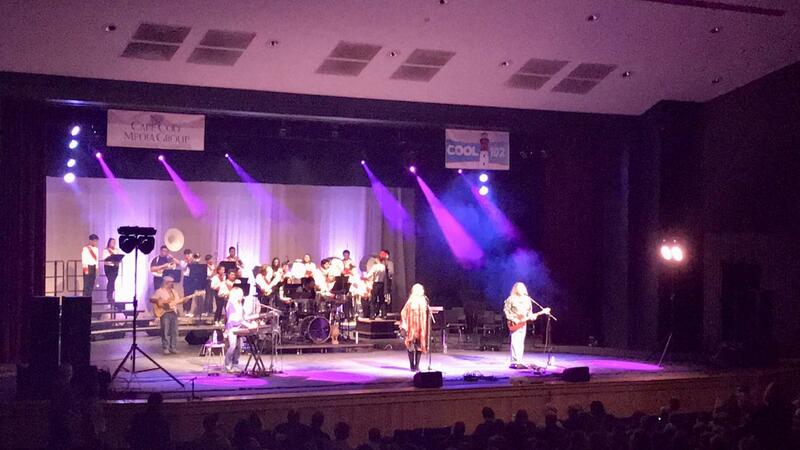 Towards the second half of the show, the BHS music students were welcomed onstage to play along with Tusk. The chorus, led by Meghan O’Connor performed Rhiannon, which was a fan favorite. It was a happy, upbeat song that brought a smile to everyone’s face. Landslide, a beautiful ballad performed by Kathy Phillips and the BHS orchestra, under the direction of Pat Ryan, was a personal favorite of the night. The string instruments were a perfect touch and set the mood of this sentimental song. The BHS Marching Band made a grand entrance down the aisles to the stage to perform Stand Back and Don’t Stop. Audience members of all ages were invited to sing along for the last song. This wouldn’t have been possible without the help of The Friends of Barnstable Music, Cool 102, the Cape Cod Media Group, and local sponsors. The entire show was a win as it was highly entertaining, while raising money towards Barnstable High Schools Music Department.